Pin board of a Milwauke Art Museum Curator. Photo by Mel Buchanan. Although I try very hard not to bring work home with me, sometimes (okay, most of the time) I can’t help it. I just love museums, and so I often find myself thinking about them after 5 p.m.
Something I’ve been mulling over for a while is the use of the word “curate”, and how the phrase has become a buzzword around the world wide web. What does the word “curate” mean in popular language–and more importantly, what does it mean for museum professionals that this word is being re-appropriated? I worried that my reaction was curmudgeonly, a much-too-traditional museum person gut defensive response. And yet, I also knew a bit about what goes into the curatorial process at an art museum–and it is a LOT more complicated than organizing a bunch of recipes into one place. So I set out to think about how to bridge together my museum-loving self with the part of me that’s interested innovation and challenges. 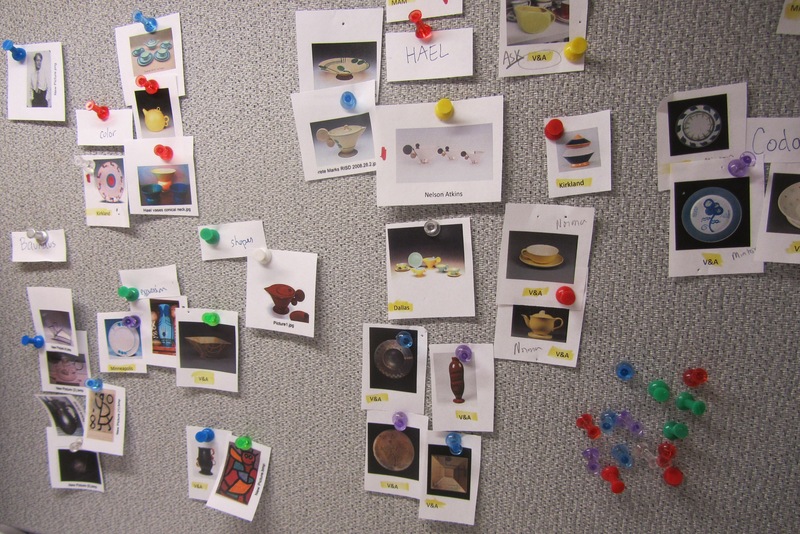 Funnily enough, Museum curator Mel Buchanan uses a non-digital form of Pinterest as part of her organization process. Photo by Mel Buchanan. To do that, I went right to the source and had a chat with Mel Buchanan, the Museum’s Assistant Curator of 20th-century Design, and also my fellow blog maven and trusty source for all things curatorial. Mel had a refreshing and thoughtful take on the re-appropriation of the word: What we mean when we say “curating” on the internet is more like being a really top-notch editor. That is, someone who is good at picking things out of the endless internet ether and organizing them into something else. What we mean when we say “curating” in an art museum is a lot more than just being a top-notch editor. But both meanings can exist and live happily together. As a curator, Mel was flattered that the word was being used widely, as it brings more “coolness” to what was once viewed as a stodgy profession. I’m all for that! These skills are things that, certainly, some internet curators do. Not everyone puts research and extensive thought into their Pinterest boards, for example, but there are definitely folks that do. One who has the care and superintendence of something; especially : one in charge of a museum, zoo, or other place of exhibit. There are definite parallels, although in practice the use of the word on the Internet and the use of the word in the Museum are somewhat different acts. After all, your Pinterest board of cookie recipes or fancy dresses isn’t caring for the cookies or clothes in any way. But keeping track of the objects, making sure they’re in great condition, and helping those objects be seen by others are all on a curator’s daily to-do list. Mel’s delineation of meanings helped me get past my indignant response and into a more positive, excited head space. (Thank goodness!) Ultimately, I think it’s fantastic for museums that museum words are making their way into the vernacular–it has the potential to give more familiarity to art museums for people who aren’t walking through galleries every day, which is of course a great thing. I also think it’s an exciting challenge for us museum people. Can we take this opportunity to hook people in? What does “internet curating” mean for the already daunting issues of artwork copyright/use online? As this casual use of “curate” becomes more commonplace, will our visitors be primed to want to engage more with Museum collections–onsite and online? How can we as museum educators, curators, and staff work together to support an environment where casual curating/engagement could lead to deeper, more sustained engagement with works of art? Because of this word use, will we see more young people who want to become (art museum) curators? How can we support them in delving deeper than just editing? I’m intrigued to see what the future of curating–in all its forms–will look like, and would love to know your thoughts. This entry was posted in Behind the Scenes, Curatorial and tagged curate, curating, curator, Milwaukee Art Museum, museums, social media, visitor experience. Bookmark the permalink. 31 Responses to What Does It Mean To “Curate”? Just found this great post from Museum Geek about this issue as well: http://museumgeek.wordpress.com/2012/04/15/a-throwdown-about-the-term-curator/ Worth a read! http://blogs.walkerart.org/newmedia/2011/12/05/reviews-of-the-new-walker-art-center-website/), by drawing from external sites and blogs. It’s interesting to think about the convergence of roles between editor/curator in this case. What does this kind of approach mean for museums? Yes, Suse! I’m a big fan of your blog, though I only recently discovered it. You get some great discussions started and one of these days I’ll have to chime in. Glad you could stop by! These are great questions–I had seen the Walker site, but not yet the list of reviews. I’m definitely intrigued to continue hearing about how the site is received by those outside of the art/museum world, too. Thanks for getting this link and the Walker into this blog post–it’s important to remember there are museums diving headfirst into the fray too! If you are interested in the Walker site, you should check out the keynote that Nate Solas and Robin Dowden gave at MuseumNext recently (http://www.museumnext.org/conference/films.html). In the last 15 minutes or so, Nate talks about the changes to visitation since the launch of the new site, and I think it’s up about 40%, with it now being a destination site (as in, visitors typed the URL directly into the address bar, rather than having to Google to find it). Really interesting stuff. Obviously not all museums will be ready to take this kind of approach, but as the values and expectations of our culture shift, because of the Internet and other innovations, then that does and will impact museums and how they think about connecting with and communicating with their audiences. One of your questions was whether visitors will be primed to want to engage more with Museum collections–onsite and online. A better question might be whether museums will be primed to engage with museum visitors on their own terms, and not simply on the terms we try to set for them. I hear you on what are the terms of visitor engagement. How do we find that out, though–what ARE visitors’ own terms? Do we go by the tech boom and social media, or are there other indicators of what visitors “own terms” are? Makes me want to run down to the entrance and just ask folks who come in! It sometimes feels like there’s a ton of conversation within the field about this topic, but not as much bringing folks outside the field. It seems like that could be changing judging from the stats about the Walker’s new website. And, on a totally different note, there’s also the question of audiences who don’t have smartphones or even consistent internet access–a completely different experience. How do they fit into the equation? As always, more questions than answers with topics like this! You should go and talk to people in the institution. It’s something I’ve done at the Powerhouse, and the results were very enlightening. I got a much better sense of the relationship b/w the web and visitors. But that is only looking at people using the site who are also visitors – what about those who use the site who can never visit? Or whom the MAM could become a resource for, but currently aren’t servicing? Is the website just an extension of the physical institution, or something else? And if something else, then how should it be designed? This moves away from your initial exploration of curating in the digital age, but such questions will impact how curators see their work in the digital sphere? Suse–great ideas and more great questions, many of which we are already asking around here. Has the Powerhouse posted/published the results of those interviews with visitors by any chance? Curious about what that relationship ended up being and how it was surprising. I’m inspired to chat with some visitors about this topic, too–a summer project. Thanks again for stopping by and spurring on this great conversation! Still, I found it useful to talk to the public, just for my own knowledge and understanding. I’d definitely recommend doing it a couple of times, just to get a sense of what your public are actually interested in. It’s enlightening. The tagline is Collect, Curate, Collaborate-and while it has not received the acclaim and traffic that Pinterest has, I do think it is worth noting what a website like this means and could mean for the art world today. Would it be beneficial, and exciting, to offer up images of fine art for the public to try their hand at curating an online exhibition of sorts? Is providing this opportunity a gateway for non-art professional museum visitors to enter the art world conversation beyond just glancing at pieces and determining whether they like it or not? I by no means have a strong background in art education, but I do believe that offering an interaction with art is highly engaging for a larger audience. Thanks Chelsea! This was a great opportunity for me to refocus on a Friday afternoon. Thanks Jess! I hadn’t heard of Kapsul, but it sounds a bit like Art.sy (http://art.sy/). Do you think we would still reach people who are non-arts professionals or non-museum visitors, if we don’t put these kinds of resources on a site like Pinterest–which isn’t as insular, say, as a specific art museum website? Even Art.sy and Kapsul might be sites that cater more to already-arts-people than a different audience. Anyway, time will tell, but I agree that the more images and material we can provide, the better! The issues come up around copyright and artists’ rights (a great article from NY Times here–http://nyti.ms/KIdiHh) and the costs associated with them. But some organizations are taking strides to work on these issues, like the Association of Art Museum Directors. Either way–great thoughts. Thanks for commenting! I, personally, wouldn’t recommend combining sites like Kapsul and Art.sy with something like Pinterest due to the copyright issues and all around lack of origin for most pins. My thought would be to use the Pinterest/Kapsul/Art.sy concept as a communications and education tool. Perhaps images of a museums collection could be curated, as in our new Behind the Museum experience, but in an online form via a museum’s website. Allowing visitors to try their hand at ‘curating’ digital images. I respect this as an interactive experience for the public but not necessarily as a refined interpretation of fine art. I do think there is a huge discrepancy between art professionals and the general public, though I question whether interactions between the two in our present time are the closest we’ve come to narrowing that gap. In the end, I do believe that art is best viewed in person with some understanding of the context of it’s creation. This is my preference as an artist of sorts. I am probably in the minority when it comes to being excited about technological advances (no smart phone, no internet at home anymore, no e-reader, etc), so I may not be the best judge of this. Perhaps there is a future for large online exhibitions- through institutions and museums with highly educated curators and educators- that could entice non-art professionals to learn more about art. Pinterest and a common use of ‘curator’ seem to make art more accessible to the masses and less respectable by art professionals. Where do we go from here? I’m so late to the game! However, the pretentious use of “curated” in the meantime has spread, like cancer, seemingly everywhere. Restaurant food is curated, as are the movies at “film” festivals. So are the bikes and accessories for sale in a Paris bike shop I visited last summer. I’ve decided the word is too hip and not yet completely overused not to use it with my work, which largely consists of selecting, organizing and conducting – I mean curating – photography outings. Thanks for the breakdown. I enjoyed it and understand the role of a true curator a bit more. I am sold . I want to know more about the art world. Pingback: What Does It Mean To “Curate”? – Bright, shiny objects!